Regular visitors to the site you’ll know that before Slimming World we used to enjoy the odd takeaway. Well, I say ‘odd’ takeaway. Whether it was Italian, Indian, Pizza or Chinese we’d have it at least a couple of times a week. Now, since joining Slimming World we’ve cut out the takeaways altogether, well we did have a Chinese a couple of months ago, but ended up with what I can only describe as a ‘food hangover’ the next day so we’ve not touched another since. So, after the really disappointing incident with the Chinese (it really wasn’t worth the syns) we decided to bite the bullet and just make, or at least attempt to make what ever takeaway we fancied. Some attempts haven’t been successful, and they haven’t yet made it to the site, but probably will with a bit more work. 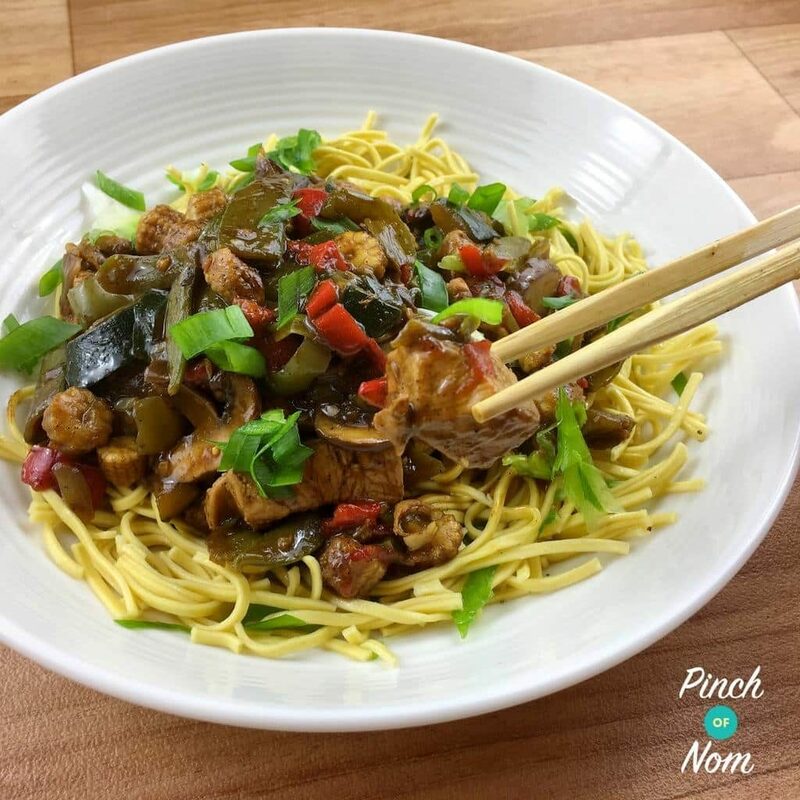 The ones that have worked have ended up on the site, and this is the latest – Syn Free Fakeaway Chicken in Black Pepper Sauce. Now, this Syn Free Fakeaway Chicken in Black Pepper Sauce has a bit of a kick to it, so if you don’t want it too peppery just use 1/2 a teaspoon of ground black pepper rather than the full teaspoon. We love to serve ours on a bed of noodles. 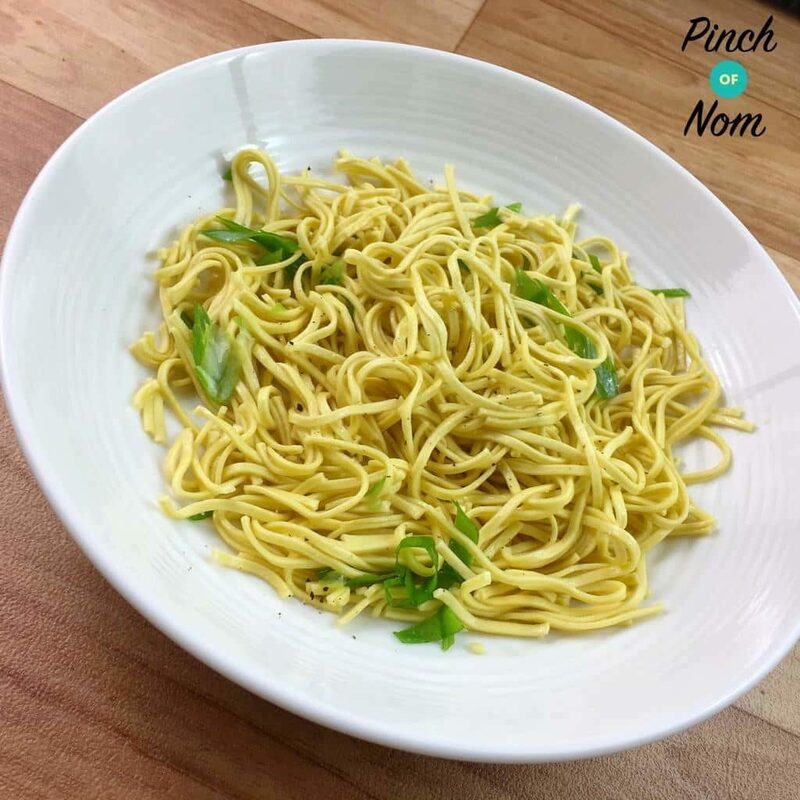 One thing you will notice about all of our Fakeaway recipes is this…..we like to add as much speed to the dish as possible. 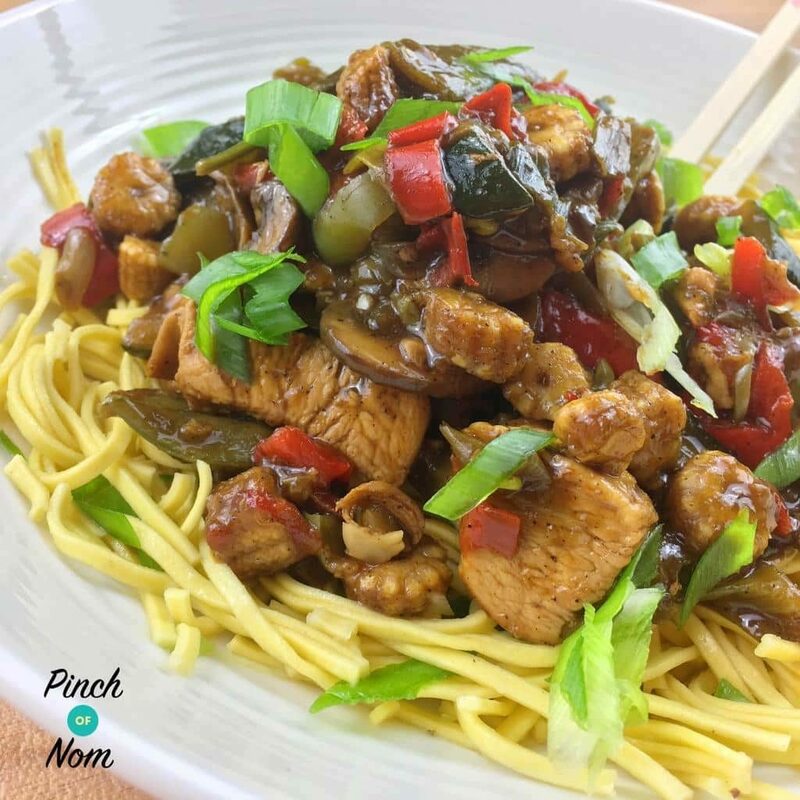 Want to see how easy this Syn Free Fakeaway Chicken in Black Pepper Sauce is to make? Watch the video! Lets be honest, who wants to add a third of a plate of speed to a Chinese takeaway? So isn’t it better to throw a load in the dish itself than not bother with any? 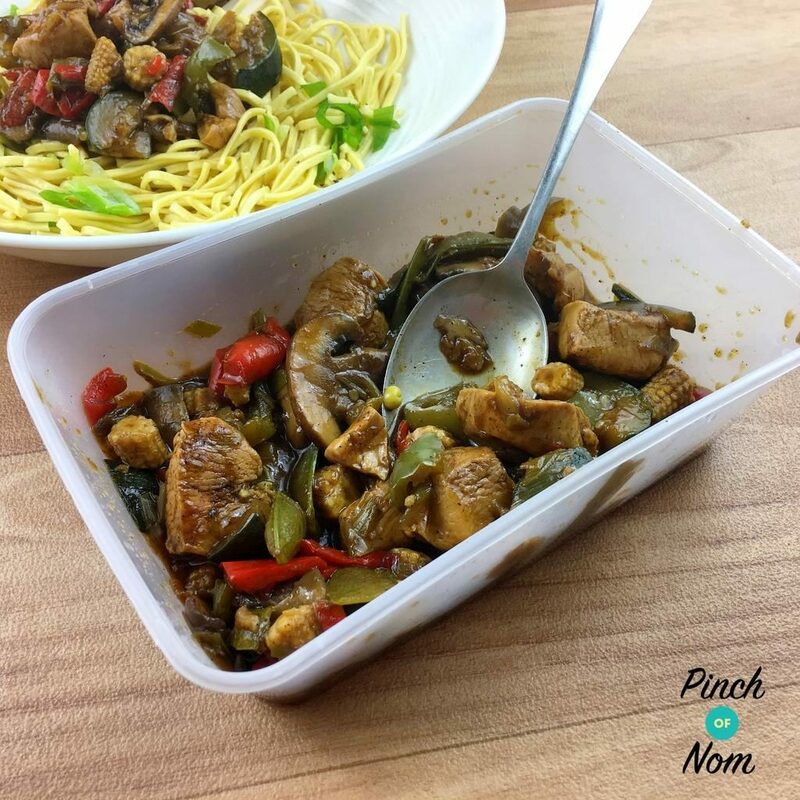 For this Syn Free Fakeaway Chicken in Black Pepper Sauce, baby corn, courgette and sugar snap peas are ideal. Along with the spring onions, peppers and mushrooms give you a huge helping of speed. You can of course use what ever veg you want. Whenever we need to replace oil in cooking we use Frylight. Perfect for everyday frying and cooking, it delivers exactly one calorie per spray, which makes it Syn free! The Coconut or Avocado Oil flavours are ideal for this Syn Free Fakeaway Chicken in Black Pepper Sauce recipe. So, what are you waiting for, dig out that wok and get cooking!! 1/2 - 1 tsp Ground Black Pepper depending on how hot you like it! Absolutely love this, now a family favourite, better than a takeaway any day! Glad you liked it. The amount of pepper is a personal choice I think, which is why we state 1/2 to 1 tsp in the recipe. where is says orange juice, is this fresh or cordial or the juice of one orange? Fabulous even though I say it myself! So much better than a takeaway. Thanks very much for this recipe. Hi. Could you use chicken stock instead of beef, would it change the flavour too much? Fresh ginger will give the most authentic flavour. You could also use the ‘Very Lazy’ ginger, which comes in a jar in white wine vinegar. It will keep in the fridge for several weeks. It’s found on the herbs and spices aisle. You could try ground ginger. I would start with a teaspoon of it and see how that tastes. You may need to adjust to suit personal taste. The recipe says 1/2 ginger half a what please? Hi, This recipe sounds amazing, def going to try it tonight. Chicken in black pepper sauce is my fav & I have been missing it since joining SW. The easiest way would be to let it simmer for longer, which will reduce the sauce so that it thickens. Another option would be to use Xanthan gum, which is syn free. It’s available from most large supermarkets, in the ‘Free From’ specialist food aisle. Soy sauce is salty by nature, but a good quality dark soy will be less salty overall. Thank you! That was the best sw Chinese meal I’ve ever cooked. Even my fussy husband loved it.